André Courrèges founded his eponymous French fashion house in 1961, quickly establishing himself by helping define looks of the era, including short mod dresses and the go-go boots. Now, the Courrèges aesthetic is decidedly of-the-moment but makes a nod to the brand’s history, with mini skirts, shift dresses, and moto jackets in bold colors and textures. Designers Sébastien Meyer and Arnaud Vaillant are currently at the helm of the Courrèges creative department, imparting their own unique perspectives on the classic brand and making it new again. 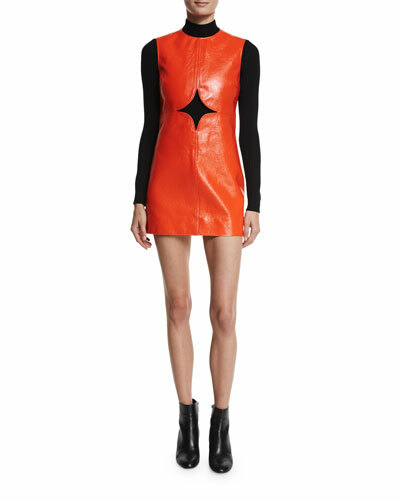 Shop a curated selection of Courrèges jackets, dresses, skirts, and more at Bergdorf Goodman. AG "The Adeline" skirt. Straight silhouette. Mini length. Side zip. Cotton/rayon/polyester/polyurethane. Made in USA of imported material. 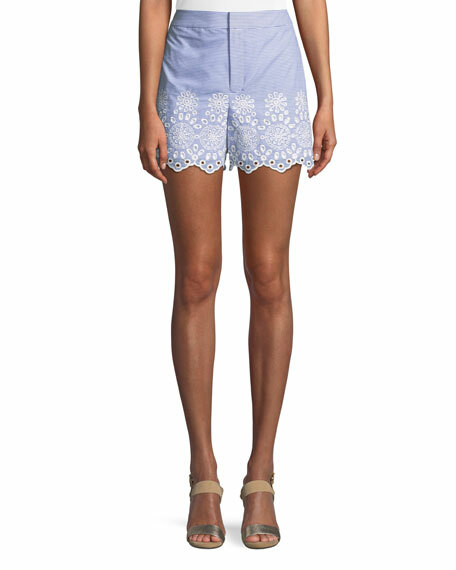 Club Monaco "Vannah" seersucker striped shorts with floral eyelet detail. Mid-rise. Straight legs. Scalloped hem. Hook/zip fly. Cotton/polyester. Imported. Vetements reworked denim jeans. Paneled pockets. High rise. Straight legs; center seams. Raw-edge step-cut hems. Button/zip front; belt loops. Cotton. Made in France. Model's measurements: Height 5'10"/177cm, bust 33"/84cm, waist 25.6"/65.2cm, hips 35.8"/91cm, dress size US 2-4/FR 34-36.